Couplings allow for easy connection of pipes and hoses and provide a way to close off the line using internal seals and valves. Breakaway Couplings – Maxbar, Inc.
Breakaway couplings are designed to permit a steady flow of material until excessive force is exerted on the coupling. Operators sometimes mistakenly begin to pull their vehicle or ship away while the loading arm or hose is in a compromising position and facilitating product flow. A spill of hazardous material could be harmful for nearby personnel in addition to the environment. Wasted product is also expensive, and the transfer equipment could be damaged, requiring time and money to fix. In a breakaway coupling, however, two internal valves instantly close to prevent spillage and product loss. The coupling pulls apart to avoid damage to the system and can be reassembled quickly by one person without tools or spare parts. The system operates independently of any other safety system and does not require electricity or power. Breakaway couplings are typically made of stainless steel or aluminum, though research is being conducted to determine if brass would also be suitable. These couplings are used mainly to guard against the unintended pull-away of trucks, rail cars and ships during the loading or unloading process. Most couplings are comprised of a male plug that is inserted into an opening in the female component. 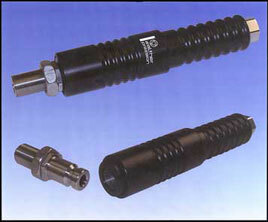 The valves inside vary depending on the application and the required quality of the seal. Breakaway couplings frequently use a butterfly system where the two inner valves have smaller discs that normally lay parallel to the coupling without obstructing or interrupting the flow of material. When a predetermined load of force is applied, the discs snap shut against the valves, stopping the flow and shutting off the hose or pipe. If enough force is applied, the two halves separate from each other, which releases the small volume of product that was trapped between the valves. Breakaway couplings are very similar to quick disconnect couplers as well as dry disconnect couplings in their ability to close off the line. Quick couplings vary in effectiveness according to their usage. For example, leaking air from a pneumatic system is not as dangerous as a system that handles oil, and therefore the coupling may have a lower quality seal. Similar to breakaway couplings, dry disconnect couplings are used in sanitary conditions or with hazardous materials, but they usually must be manually separated; they do not automatically close and break away with excessive force. Breakaway Coupling Breakaway couplings are used to safely eliminate spillage in situations where hazardous materials are being transferred.